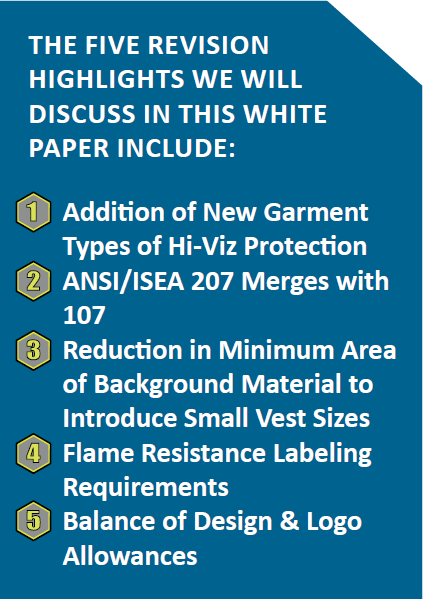 The ANSI/ISEA 107-2015 Standard provides criteria for materials, test procedures, design, labeling, and care instructions used in the construction and manufacturing of high visibility apparel. Radians is a member of the High Visibility Products Group of the International Safety Equipment Association (ISEA) and has been actively involved with the ANSI/ISEA 107-2015 revision. This explanation is intended to help users of ANSI/ISEA 107 rated HVSA understand revisions to the 2015 update.